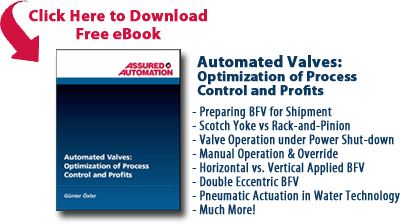 Assured Automation’s VA Series (valve + actuator) is an integrated on/off valve and pneumatic actuator. It has proved to be a valuable component allowing more compact piping installations and unique new product offerings. 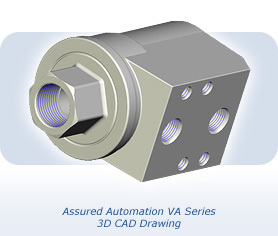 When the VA Series was introduced 10 years ago, it was considered a unique specialty automated valve product, and is now used in many new applications beyond its original design intent. The VA Series replaces angle valves and ball valves in many installations due to its reduction in size and competitive cost. It also replaces large solenoid valves where small orifices clog and diaphragms rupture. The VA series was developed for clean media applications such as compressed air, water, oil and other clean media compatible with brass and standard seal components such as VITON, BUNA N and EPDM. When compared to angle valves the VA Series occupies significantly less room while delivering the same or a better flow coefficient at a more competitive price. While it is smaller and less costly than ball valves it does have a lower flow coefficient which in a lot of applications is not a problem. The compressed air port of the VA Series is designed to accommodate NAMUR style solenoid valves. The NAMUR standard provides standard mounting interface dimensions for pneumatic actuators, making standardization easier for many manufacturers. It also can be fitted with position indication switches by adding a magnet on the piston and an exterior reed or solid state switch to read the piston position. Configure VA Series or View our other valve configurators! This entry was posted in Latest News and tagged Compact Automated Valves, Double Acting Valves, Pneumatic Valves, VA Series. Bookmark the permalink.